NVRR FPA4 72 sitting at the engine house with sister FPA4 NVRR 73 on a rainy Saturday, March 9, 2019. 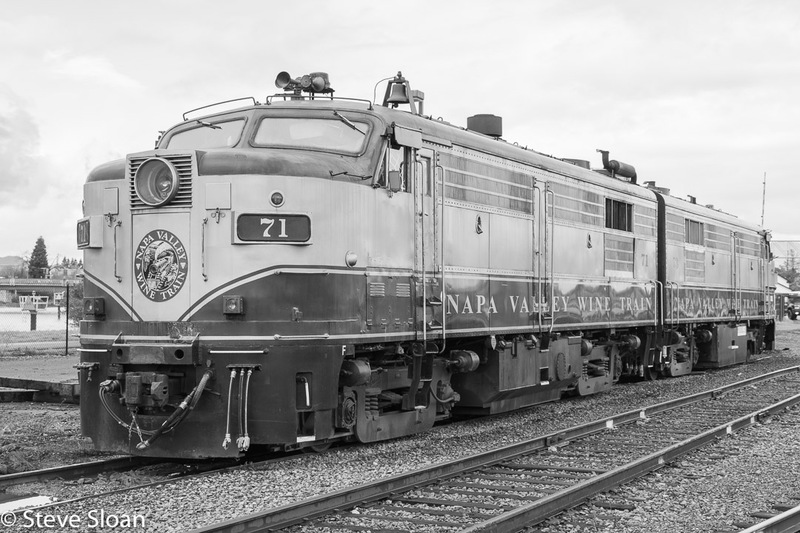 Napa Valley Railroad (NVRR) is a railroad line that runs between Napa and St. Helena, California. Much of the rail line parallels State Route 29 after leaving the City of Napa and passes the towns of Yountville, Rutherford and Oakville. The route passes by many the region's vineyards and wineries located in Napa County. According to good sources, including Strapac's fantastic SP Compendium series, NVRR 62 was built in 1959 by ALCo as a model RS11, builders number 83416, SP 5854, SP Class DF-613. In 1965 it was renumbered to SP 2919 SP Class AS418-4. This locomotive was sold in 1980 to Kyle Railways and was assigned to California Western becoming their #62. 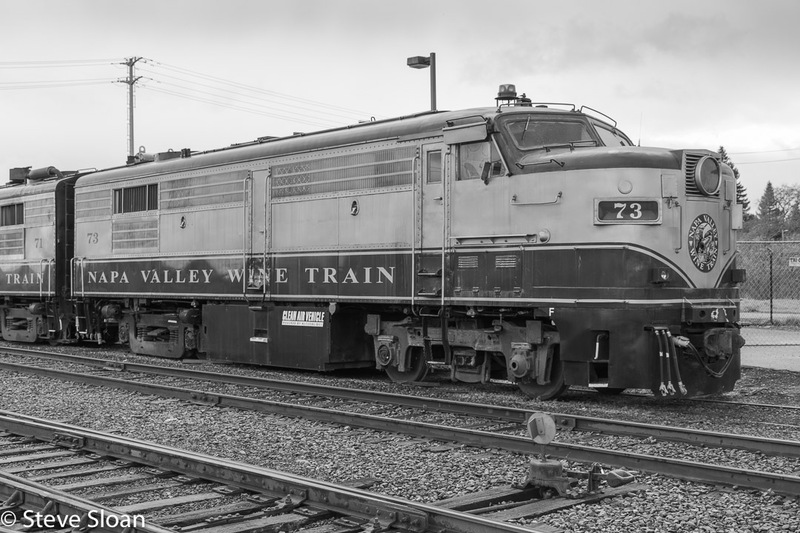 In 2000 it was sold to Napa Valley Railroad, becoming NVRR 62. 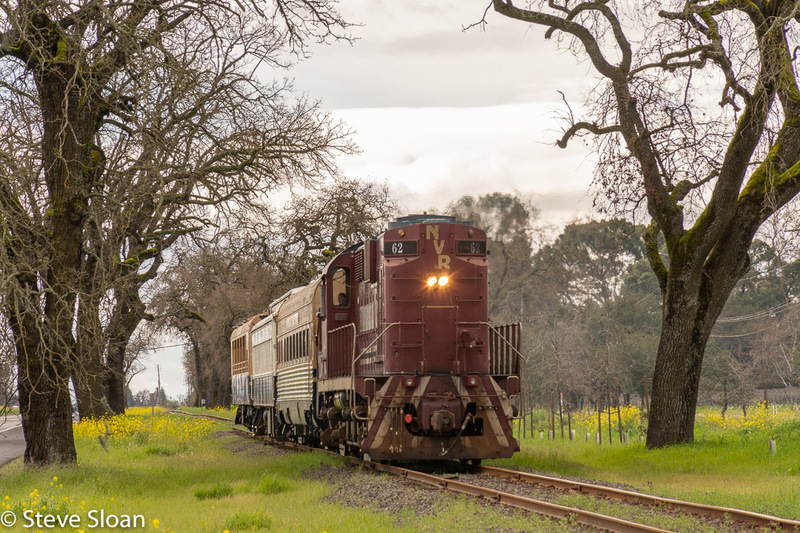 Napa Valley RR 62, a former SP RS11, pulling a shuttle train near Silenus Winery in Napa, CA on Sunday, March 10, 2019. According to good sources NVRR 72 was built in 1959 by ALCo/MLW as a model FPA4, builders number 83165, Canadian National 6787. It became VIA 6787 then NVRR 72. According to good sources NVRR 73 was built in 1959 by ALCo/MLW as a model FPA4, builders number 83168, Canadian National 6790. It became VIA 6790 then NVRR 73. Repowered with a EMD 12-645E burning natural gas. NVRR FPA4 73 sitting at the engine house with sister FPA4 NVRR 72 on a rainy Saturday, March 9, 2019.